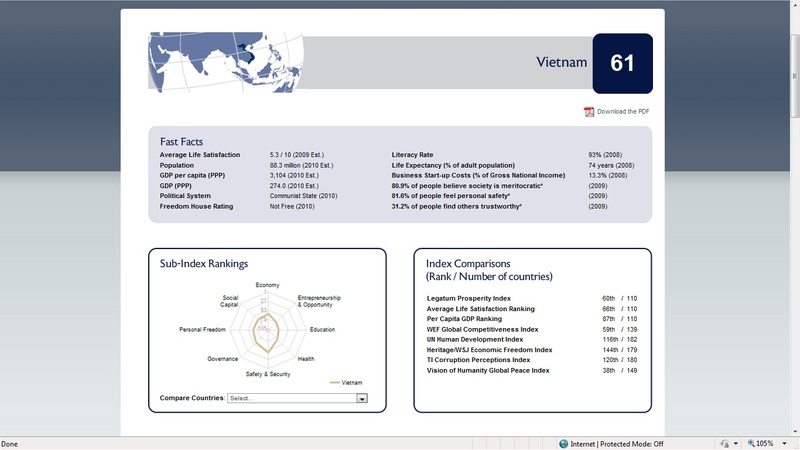 According to the Legatum Institute, an independent, non-partisan organization that researches and advocates for an expansive understanding of global prosperity, Vietnam ranks 61st in its annual prosperity index. The 110 Prosperity Index countries represent approximately 93% of the world’s population and 97% of global GDP. Interestingly (and ironically), Vietnam ranks higher than Russia (63) and Ukraine (69). Each profile begins with a list of Fast Facts, including Average Life Satisfaction, Literacy Rate, Population, Life Expectancy, GDP per capita (PPP), Business Start-up Costs (% of Gross National Income), GDP (PPP), percentage of people who believe that the society is meritocratic, Political System, Personal Safety,etc. It also includes Sub-Index rankings and index comparisons. Education – Ranked 81st: Despite low levels of enrolment Vietnamese report they are satisfied with the educational system. Educational enrolment is generally poor, with Vietnam placing 61st, 79th, and 84th, respectively, for net primary, gross secondary, and gross tertiary enrolment. With a ratio of 97 girls per 100 boys in primary and secondary schools, Vietnam has a slight under representation of girls in primary and secondary education. Class sizes are also worse than average, with 20 primary school pupils per teacher. Surprisingly, Vietnam places sixth, globally, for the very high 88%* of people who are satisfied with the quality of education. Paradoxically, a lower 81%* believe that children have the opportunity to learn and grow every day, which places the country only 43rd on this variable. Thus far, education has made a limited contribution to the realised value of human capital, with the average worker having undergone just over a 1.5 years of secondary education, and around five months of higher education, placing Vietnam 72nd and 84th on these variables, respectively. I beg to differ with the conclusion – based on Gallup Poll data (see graph above) – that most Vietnamese “are satisfied with the educational system.” Regarding the economy – as mentioned in a previous post, Vietnam and Indonesia share the world’s second highest ranking (behind India) in consumer confidence, according to a 2010 Nielsen survey. The Legatum Institute is a division of Legatum, a global investment organization with a 20-year history, allocating proprietary capital in the global markets and to programs that promote sustainable human development. ← where can i buy an accredited overseas phd?